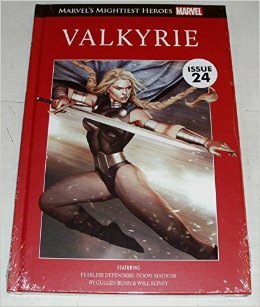 I was very intrigued when I realised there was a superhero known as Valkyrie in the Marvel universe. Even though I didn’t get to see Brunhilde’s first appearance, I did like the comics that were chosen for this collection. It was nice to see Misty again in this volume. I really liked Annabelle’s character, too. Even though she wasn’t technically a superhero, I thought she was still a strong character. I would have liked to see more interactions between Brunhilde and Annabelle. I thought Annabelle’s crush on the Valkyrie was really sweet. I thought it was really interesting to learn more about Brunhilde’s past… though I couldn’t help but feel some sympathy for the other Doom Maidens, since Brunhilde was saved while they were apparently abandoned. There were some nice elements of humour in this set of comics, but there were also some scenes that were really sad. Although I did enjoy the comics as a whole, the ending was kind of depressing and I think there should have been more to it. I thought it was interesting to see many of the other female superheroes in the Marvel universe. I never realised just how many there were until they all showed up… but it was pretty cool to see all of them joining forces to battle. And I thought it was pretty cool to see the Amazon Queen and how she and Brunhilde seemed to have a lot of conflict between them. I would have liked a bit more detail about Hela’s relationship to Dani and I was a bit confused by the AllMother. I did quite like the artwork in this comic book and I was drawn into the storyline really easily. There was enough tension and mystery to keep me reading through, wanting to know how the miniseries would end. There was some really good artwork, but I would have liked to see more of the Doom Maidens individually, rather than as a whole. I would have liked a bit more background as to what the bad guys actually wanted. I would be interested in seeing more of Brunhilde in the future. I found her an interesting character and her history in the Marvel verse sounds really intriguing as well.